A luxury 2 bed villa with private pool and volcano views. Sleeping 4/6, this Moorish-style villa is just 3km outside Corralejo on beautiful Fuerteventura. 4 hours from the UK and Ireland and little over 50 miles from the coast of Africa, there is guaranteed sunshine year round. Our corner-plot villa is in the residential community of La Capellania (Tamaragua), just outside the main Corralejo resort, with its own: large supermarket, bars, restaurants, childrens' playgrounds, basketball courts, and shops. About 40 minutes car drive from the airport, all the major car hire firms are available at the airport - taxis and buses are also frequent, if you prefer not to hire a car. Looking for adventure? We're close to: deep sea fishing, scuba diving, combat adventure, submarine and boat cruises, trike, quad and offroad safaris, snorkelling, or visit the Acua Water Park. We are a family of four, mum, dad and two (teenage) girls. We wanted a home from home comfortable place for family holidays and had enough of renting villas and finding the photos and descriptions didn't quite match the reality. We have made a point of accurately and honestly describing everything that we have on offer. After renting in the area for some years, we had become addicted to the consistently great weather, welcome and range of bars and restaurants in a truly exceptional location. The beauty of staying in La Capellania is that it is 3km out of town, far enough for peace and quiet, close enough to get access to the resort when you want it. Family bathroom with WC, bidet, wash handbasin, bath with shower over. with Flatscreen TV, DVD player, PlayStation3, UK Sky TV (no BBC1 or 2), cable TV (mostly Spanish channels) - bring your own DVDs and PS3 games - although we have left a number for you to enjoy. The dining area has a full size dining table with 6 chairs. Fitted with all the integrated appliances you'd expect: oven, 4 ring hob, extractor hood, full size fridge freezer, dishwasher, Tassimo® coffee-maker (the pods are available on the island, for great coffee on the patio). Highchair available for local hire. You're spoilt for choice with 5 island golf courses. (Watch out for the 6th course opening opposite La Capellania soon). one step into front door of property and one step out to patio. Internally all on one level with no steps. Notes on accommodation: Additional baby/child items (high chair, cot and buggy) are hired locally from our English speaking property managers. Outside: Large private patio - not overlooked - with furniture (table, 6 chairs, 4 loungers, umbrella) and private pool warmed by the sun. Typical Canarian garden with aloe vera, cacti, palm, hibiscus and other water hardy plants. Irrigated automatically, you'll always have a green garden to enjoy. Gardens at the front with driveway for off-road parking. Utility Room: There is an automatic washing machine and Belfast sink in the separate utility room - although you won't need a tumble dryer - remember this is Fuerteventura. Clothes horse, iron and ironing board provided. Cleaning / Towels / Linen / Maid service: Towels and linen included (but not beach towels). Changed weekly. Cot, highchair and push-chair hire available (reserve with booking - but pay locally). UK mobile reception - good. Just loved it, easy directions from the airport, all the amenities you could want, lovely pool for cooling off. Fans in every room. Great internet TV including UK, US and Irish channels. Fully equipped kitchen. Very clean throughout, loved it. What a fantastic holiday! My partner and I have just returned from our 11 night stay and can't praise this accommodation highly enough. Lorenzo provided in-depth instructions for travel from the airport, access to the villa and wifi access. The villa itself is a great base for exploring the island and had everything we needed and more to make our stay comfortable. The patio and pool area was private and quiet and the pool was fantastic for cooling off in after a day out at the beach. There were lots of books, dvds, and games to keep us entertained and there were plenty of channels available on the TV. There were 3 fans which we made full use of and between that and keeping the doors open later at night before bed, the temperature was perfectly pleasant during the night. 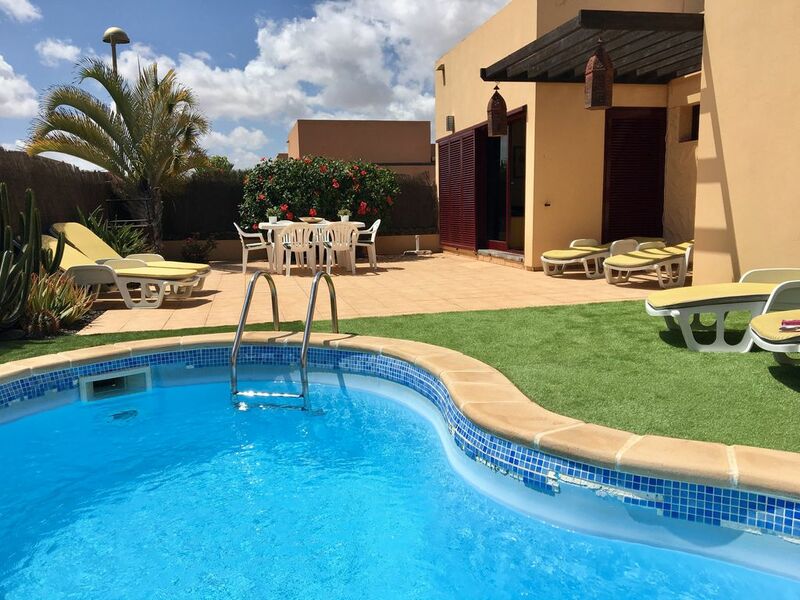 The villa is in a quiet area with a supermarket within walking distance, and Corralejo just a 8-10 minute drive away. We hired a car so can't comment on the public transport but found getting around the island easy and not too busy. I hope to book another holiday here next year with my parents and sister for a family holiday this time. Thank you Lorenzo and Debbie for allowing us to stay in your lovely villa, it was an absolute pleasure! Thank you so much for your kind review, we are delighted that you enjoyed your stay and the facilities offered within the villa. We have tried really hard to make sure that there are all the things you could need to have a 'home from home' experience. We look forward to welcoming you back soon. Thoroughly enjoyed our holiday staying at Lorenzo and Debbie's villa near Corralejo. Received good instructions to route to the property plus entry and operating instructions to the very tidy and well equipped villa. Plenty of reading material together with wi-fi, TV and video plus X Box available . Pool too cool to use in March probably caused by stronger than normal winds prevalent at the time. Plenty of sunshine with short walk to well equipped local store. This was our second visit in two years and an ideal base to drive out to the attractive villages and scenery in the area. Happily recommend the villa as a holiday home. Thank you for taking the time to review our villa Alex, we’re delighted you enjoyed your stay. We hope to welcome you back to stay again. This villa was just.... WOW!! The location is perfect, quiet and just a short drive to the main town. Lorenzo was fantastic before the stay and gives you everything you need to get there. The villa is much bigger than we expected, light and airy and in extremely good condition. The outside space is perfect it is private and the pool is perfect for those hot days! To say Lorenzo and Debbie provide the basics is an understatement they go above and beyond to make you comfortable and provide everything you need for a perfect stay and more! We will most definitely be booking again! Thanks Lorenzo and Debbie for a fantastic stay in your villa. Had a lovely stay and enjoyed the villa, particularly pool for the children. Clean, neat and tidy with lots of facilities and great to have beach shelters and boogy boards to borrow. Perhaps a little tired but great value and enjoyed out stay. 3km (5 minutes by car) to Corralejo (a breathtaking blue flag beach of 7 miles of golden sand - so there's always space! Patrolled by lifeguards). 15 minutes by car to El Cotillo -for safe bathing for all the family on golden sand and crystal clear lagoon waters. (Online card payments in euros, other payments in GBP(£): 350 per week). There are over 150 beaches with golden sand to explore. Full beach guide in the villa. Airport is 40 minutes away by car - a very easy straight route through National Park sand dunes - but there are plentiful taxis and buses to La Capellania. (Taxi fares are regulated, so look out for the poster declaring fares at the airport taxi rank). But we recommend car hire to explore this wonderful island. Ferry to Lanzarote available in Corralejo (3km). La Capellania is 3km inland from the main resort of Corralejo, the nearest beaches and the Baku Water Park. Is this a Special Holiday - or do you just like to feel pampered? Additional services are available and can all be reserved for you when you book (and are payable locally on arrival) including: welcome packs (tell us what you want included), champagne, flowers and excursions with English speaking drivers. Booking Notes: Full payment due 8 weeks before travel. We don't ask for breakages deposits. Changeover Day: Check out is 10am and you can get access from 3pm, but again flexibility may be possible. Prices: Prices are in euros if you use HomeAway Payments. British pound (£) payments for Paypal, cheque or bank transfer are possible £395 per week.